1. What is the scripture of Islam religion? 2. How many chapters are there in Quran? Answer: A scheme of life as revealed to Mohammad by Allah. 5. What is the term used in Quran to refer to the message the Muhammad get from Allah? 7. Messages revealed to Muhammad during which period are collected in Quran? Answer: During the age of 41 to 63. 8. In how many ways do the Muhammad get messages according to Quran? 10. Who is the first Caliph after Mohammad? 11. Who was the third Caliph? 12. Quran is divided into how many parts? 14. Quran declares, ‘He will purge man of his chains and the weights imposed on him’. Who is the ‘He’ referred to here? 15. What promise did Quran make as it came into existence? Answer: That it would wipe away the practice of interest on money. 16. Who is Abbas ibn Abdul-Muttalib? Answer: Brother of Muhammad’s father. 17. Who said this: ‘Oh father, I have got the knowledge (from Allah) that you didn’t’? 19. What is Quran meant for? Answer: To lean man ahead without diverting him from high standards. 20. Which chapter in Quran stresses monotheism? 21. Why are the philosophic teachings in Quran repeated? Answer: To remind the high values of life even at a random reading. 22. Where does Quran recommend reading it during night is more fruitful because during night mind will be free from all other thoughts? 23. Who is the official spokesman of Quran? 24. What is the term used to refer to the explanations and actions of Mohammad? 25. Name the book which’ has set forth Mohammad’s routine life and pieces of advice? 26. How many subjects as classified are there in Quran? 27. 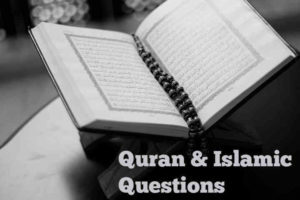 What all are the subject matters dealt in Quran? Answer: Faith, rituals, virtues, dealings, punishments. 28. What does ‘Malaikah’ mean? 29. What is the word used in Quran to refer to messenger? 30. Why does Rasul called so? Answer: Because they ran errands between the creator and the created. 31. What does the number of wings of angels represent? Answer: The speed at which the mission of Allah be spread. 32. In which part of Quran do we find that angels would pray for the redemption of the believers? 33. Who are angels as believed by the Arabs? Answer: The daughters of Allah. 34. What are angels called in Zoroastrianism religion? 35. Which part of Quran declares there is no community without prophets? 36. Where did the prophets mentioned in Quran live? Answer: In Middle East countries like Arabia, Iraq, Syria, and Palestine. 39. Another word for Taqdir? 40. The most important ritual in Islam? Answer: Salutation to God called Salah. 41. Why do Muslims observe ‘Salah’? Answer: To surrender one’s self to God’s will. 42. How many times in a day should one observe Salah? 43. Which part of Quran should one recite during ‘Salah’? Answer: First chapter of Quran. 44. Which part of Quran mentions the achievements in life as a result of observing Salah? 45. Which month is chosen for observing fasting? 46. Why is the month of Ramadan chosen for observing fasting? Answer: Because it was in a month of Ramadan that Allah revealed the sacred Quran for the first time. 47. Who are all exempted from observing fasting? Answer: Patients, those who are at a journey, the carrying ones, breast-feeding mothers, the menstruated ones. 50. Quran refers to Mecca by another name. What is it? 51. What does the word Umm al-Qurā mean? 52. What is meant by Hajj? Answer: Representatives of Muslims all over the world assemble in Mecca and take decisions for the wellbeing of Muslims and the human race at large. 54. How many times does one go round Kaaba in one Tawaf? 56. When should the Hajj pilgrims be present in Arafah? Answer: During the afternoon of 9th of Dhu al-Hijjah. 58. Which is the first cultural home built for human race, according to Quran? 59. What is the stone fixed in the wall on the corner of Kaaba called? 60. What does the word Hajar al Aswad mean? 61. Where did Ibrahim take his son for sacrifice? 62. During whose period was Hajj introduced? 63. What is the shape of Jamarat? Answer: A dowry paid to bride in honor. Answer: The period during which a divorced woman can stay in her hither to husband’s house. 66. The duration of iddah of a divorcee woman? Answer: Till the woman undergoes three menstruations after her divorce. 67. After how many days can a divorced woman marry? 68. What does Quran call money? Answer: The life vein of man. 69. Money is referred to as what in Quran? 70. How many skies does Quran mention about? 71. Where does Judee hill located? Answer: Corduene, south of Lake Van. 73. From whom does Aad Community start? 74. Ilyās belongs to which origin? 75. Where did Ilyās live? 76. How many classes are there in Aad Community? 77. Which community does Salih belong to? 78. Where did the Thamud Community live? 79. The borders of Hegira? 80. Where was Ibrahim Nabi born? 82. Where did Ibrahim accommodate his second son, Ishaq Nabi and his family? 83. Where did Ibrahim Nabi accommodate Lot Nabi? 84. Who is considered as the forefather of the Jews, the Christians and the Muslims? 85. Whose offspring’s are the Arabs as it is believed? 86. Which race is considered as the descendants of Ishaq? 87. Who is known by the name Isra’il? 88. What does the word Israel mean? Answer: The servant of Allah. 89. What does ‘Bani Israeel ‘ mean? Answer: The offspring’s of Israel. 90. Quran calls the Christians and the Jews Bani Israeel. Why? Answer: Because it is considered that they belong to the descendants of Israel. 91. During whose time did Lot Nabi live? 92. Which is the native place of Lot Nabi? 93. Where is Sodom located? 94. Who is Yūsuf Nabi? Answer: Son of Yakub Nabi. 95. Where is Baalbek city situated? 96. Name the Israel origin prophet and king? 97. Where did Syu’aib Nabi live? 98. Where is Madyan situated? Answer: In Hijas near Syria. 99. Who helped Israelites to enter Egypt? I think question 33 (part two) answer is absolutely NOT correct because the angles are not Allah’s daughters. Allah don’t have any child. this is what is mentioned in Surah Ikhlas, in Quran.